In 1967 the nineteen-year-old David Levy was an enthusiastic observer, and an observationally active member of the Montreal Centre, pursuing his life-long quest for comets, and an ever deeper familiarity with the night sky (activities which he knowledgably, imaginatively, and fruitfully pursues to this day). I had just suffered through the first phase of what is now known as the “observatory crisis,” during which Isabel K. Williamson, then director of observational activities for the Montreal Centre, had threatened to cancel my membership because she thought I had broken the observatory barograph. Anyway, I was so excited about finding the nebula (NGC 6207, a faint galaxy near M13, or NGC 6402 [M14], placed low in the sky and appearing comet-like) that I resolved that no matter what, all would be well on my return to Montreal. It wasn’t. The following Wednesday I was yelled at and physically pushed out of the building. I decided that day to resign my entire interest in astronomy, comets and all. But that morbid feeling didn’t last long. Instead I quickly resumed all my activities, and some ten years later, while working on my master’s degree at Queen’s, I wrote to Isabel Williamson to ask how she was doing. She replied that she was fine, and invited me to call on her on my next visit to Montreal. Although she never apologized to me, these visits became a staple of all my Montreal trips for the next two decades, and her indication that all was well, until her death in 2000. We did become good friends at last, and I successfully nominated her to receive the Royal Astronomical Society of Canada's Service Award, and successfully proposed that the Centre’s Observatory be named after her. 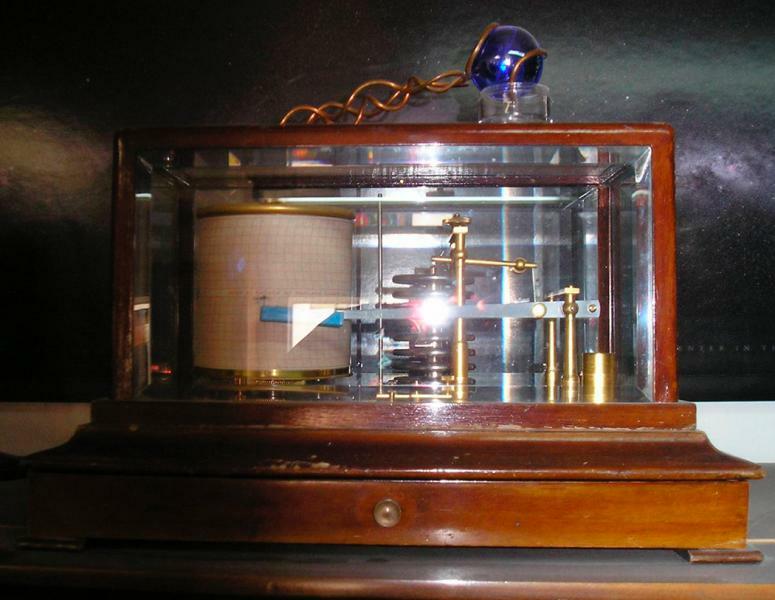 To close this interesting chapter of my life, during a recent visit the Montreal Centre decided to give me the precious barograph, which stands atop my bookcase in a place of honour at Jarnac Observatory. The letter reproduced in facsimile here is from Theodore F. Morris, a professor of theoretical physics at McGill (1949-1987), and the second person to complete the Montreal Centre's Messier list (and one of the first people in the world to do so as a member of a Messier club, as was David himself - the Club's creation was due to Ms Williamson). The letter resulted directly from David's misunderstanding with Ms Williamson, and was part of the strategy of the Montreal Centre's establishment to control the situation. Other measures included a formal meeting at which the "observatory crisis" was discussed, and an attempt made to expel David from the RASC. Saner heads spoke up in favour of not forcing him to walk the plank. (On May 18, 1967, just two days after the Board meeting during which he was almost expelled, David received a brand-new 6-inch reflector he'd earlier ordered, and its timely arrival served to buoy his astronomical spirits. That telescope, subsequently named Minerva, is numbered among those still in service at Jarnac). Fortunately for the RASC, amateur astronomy, and the world of astronomy in general, David weathered the storm, continued to observe, and went on to a successful career of scientific discovery, astronomical writing, and effective education and public outreach. It's astonishing that in the end no souls were lost overboard during and after the "observatory crisis" - but that fact speaks to the qualities of the characters involved, in particular the extraordinary patience and persistence of a nineteen-year-old observer. Time heals, and there is much to be said for reconciliation if the parties are amenable to it. It hardly need be observed that institutional factionalism is never a positive thing. If there is a lesson here, it is that organizations ought to think carefully before eating their young, and devouring their future. Not every analogous story has such a fortunate ending. All images are copyright Jarnac Observatory, and are not to be used without permission.